So what did YOU do this past Labor Day weekend?? I hope something brilliant and lazy and beautiful. Me, I spent sunrise and sunset hours packing, throwing stuff into garbage bags, loading and unloading, chugging water and smoothies (the Vitamix is the last item I pack and first item I unpack!) and everything that goes along with moving. But yay, I am happy to report we are moved! Thank goodness. And I am heaven with a larger kitchen and fresh breeze through our windows. But with all this moving stuff, I seriously have a starkly empty fridge and almost bare pantry. Feels alien to me. (Fun fact, my husband literally had only bottled water and mustard in his fridge when I went over to his place on one of our early dates years ago. I was in shock and still get to laugh about it.) Oh how times change! So with my almost-bare kitchen, cooking is not really happening - BUT I did have a few ingredients on hand to make today's easy meal!.. Simple, Sassy, So Good Food. 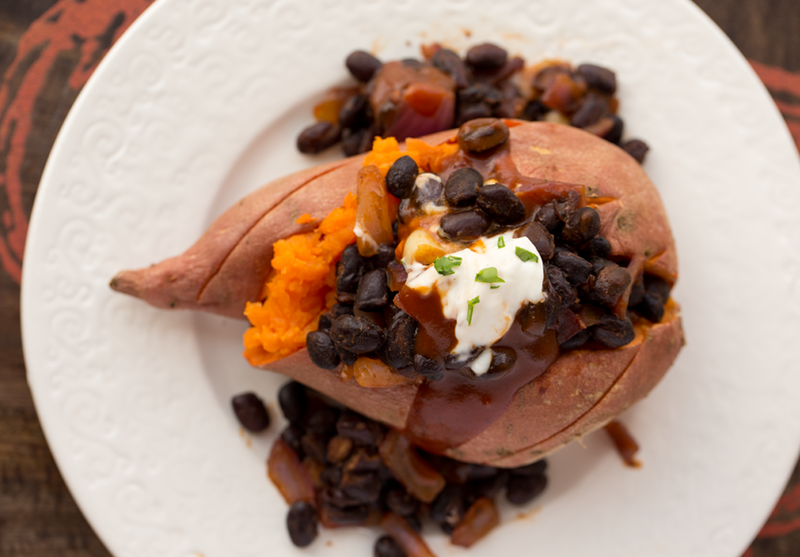 This BBQ Black Bean-Stuffed Sweet Potato is a swanky, steaming, symphony of flavors: smoky-sweet BBQ sauce, comforting sweet potato, rustic black beans and accents of garlic and red onion. 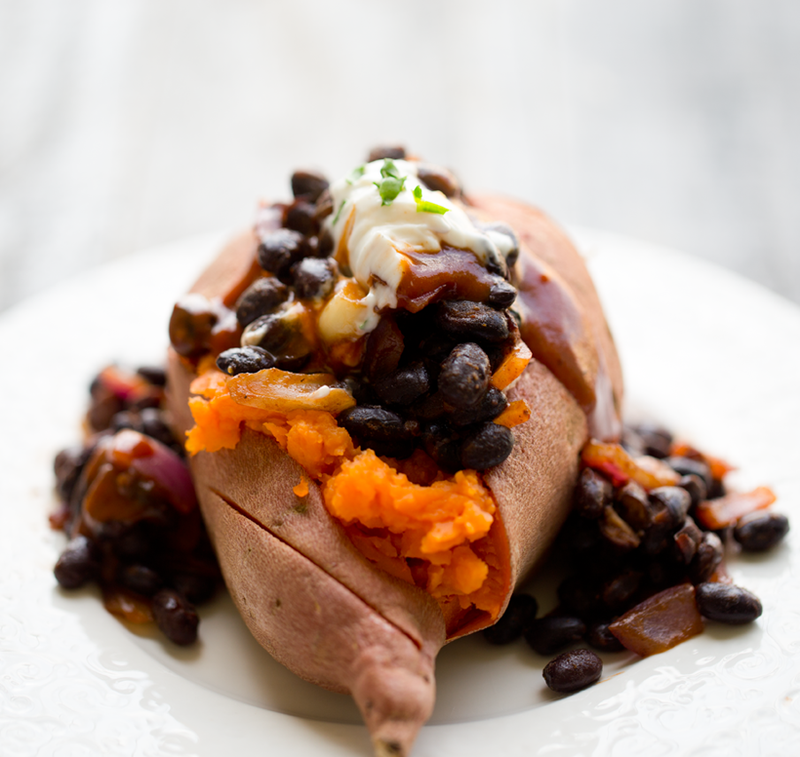 I loved this lunch today and hope you can give it a whirl and love it too!.. Special Delivery. So I am actually holding off on loading up the fridge because I have a really exciting and fun delivery tomorrow - I can't wait to share the next (hint hint) 21 days with you guys. I will be posting all about it in my next post. Should be interesting! (And delicious.) 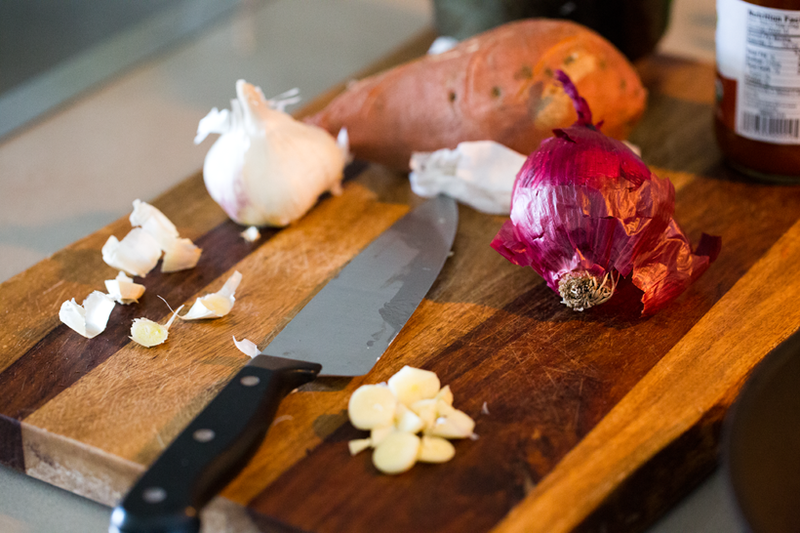 If you are a veg-curious person, you will especially love this little adventure of mine. 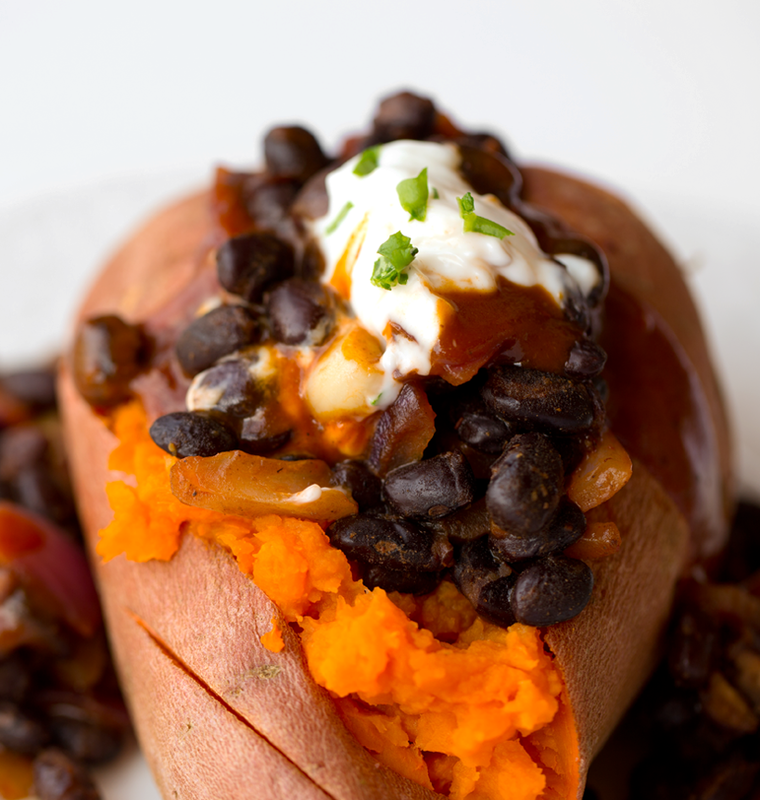 Sweet potato lovers unite. 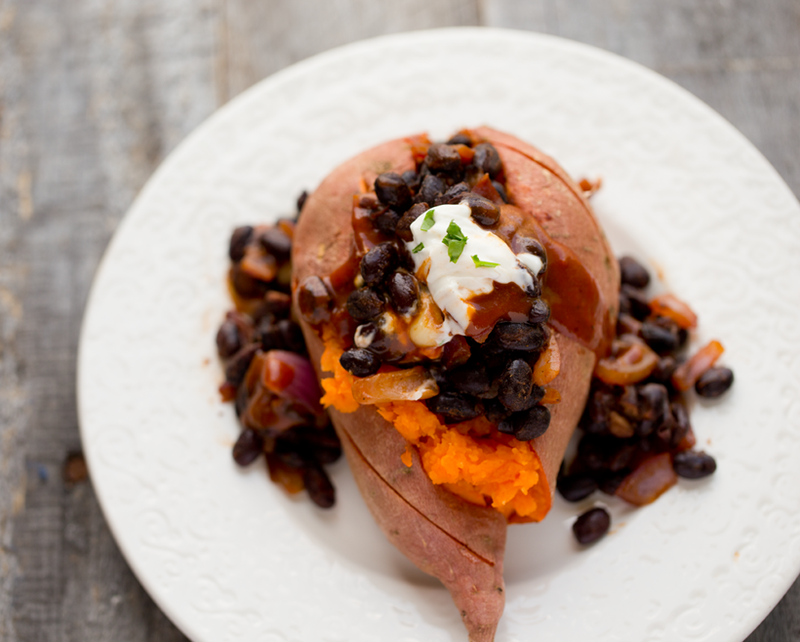 This easy meal is something you will be so anxious to spoon or fork-dive into once you prep it in minutes. 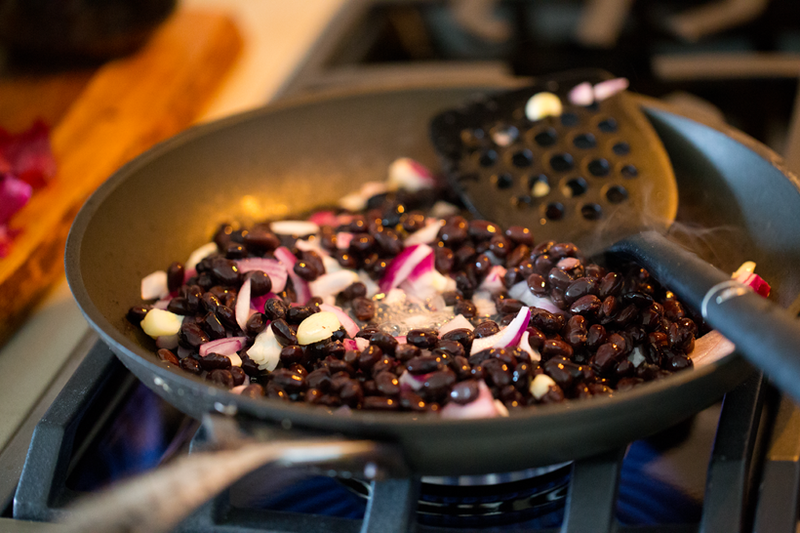 Skillet beans with onion and garlic..
Add in the BBQ sauce..
Top it off with more BBQ sauce and Vegenaise.. This super easy recipe can be whipped up in minutes. 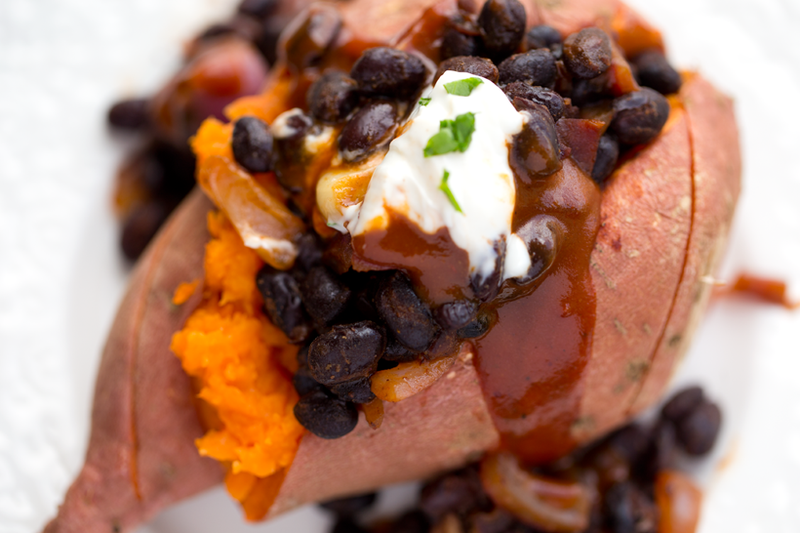 Smoky BBQ sauce mingles with skillet black beans with garlic and red onion - all stuffed inside a steamy sweet potato. Vegan mayo on top! 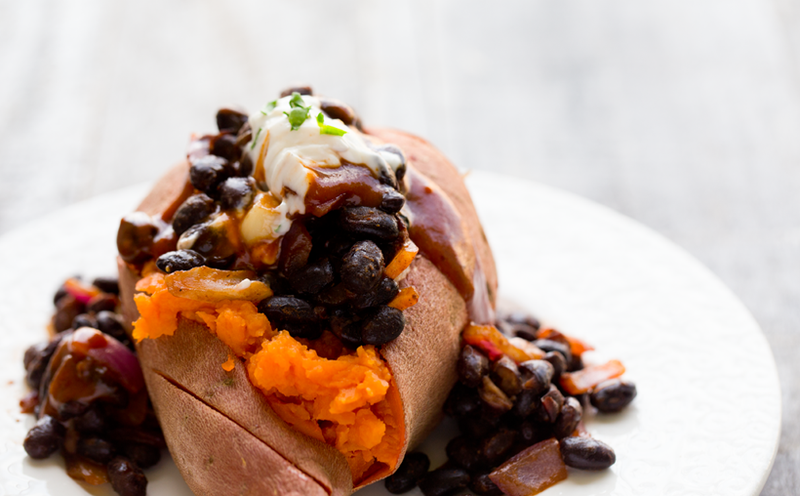 **speedy tip: For speed and deliciousness, I like to pre-bake a few sweet potatoes, then just reheat in the oven when needed. Or you can always use your microwave if you are ok with that. I personally have no problem popping a potato in my micro when I'm in a rush. 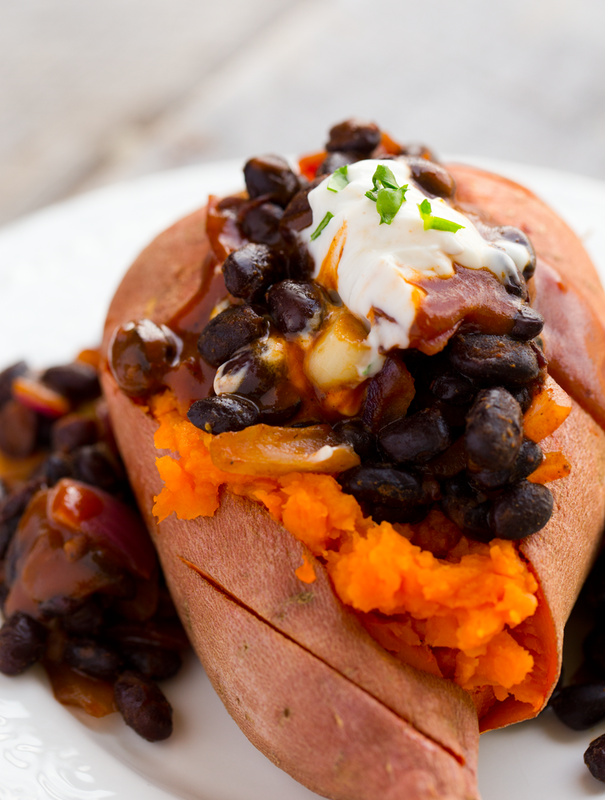 But of course the BEST flavor and texture will come from an oven-baked sweet potato. So if you have time, use your oven! Warm a large skillet over high heat and add the oil or water/broth. Add in the garlic and onion, and saute for 2 minutes to slightly brown. 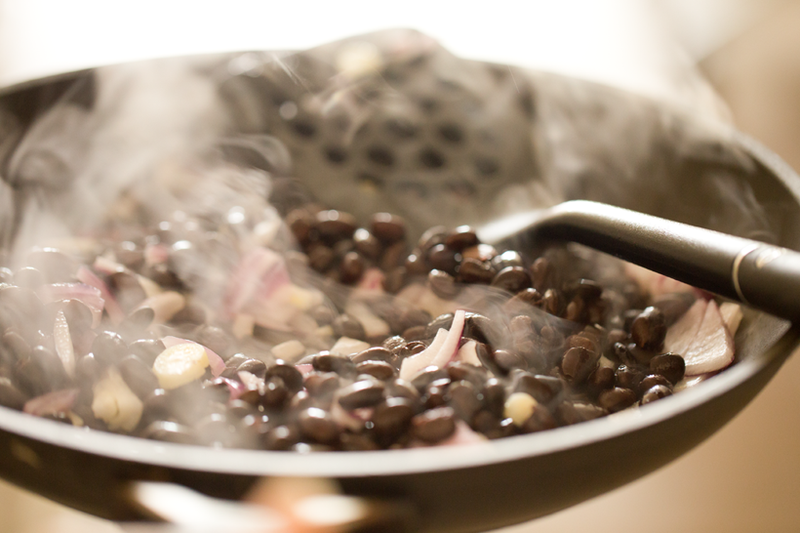 Add in the black beans and optional sea salt and toss around in the skillet a bit to warm the beans, about a minute. Pour the BBQ sauce into the skillet. You can use as little o as much as you'd like! 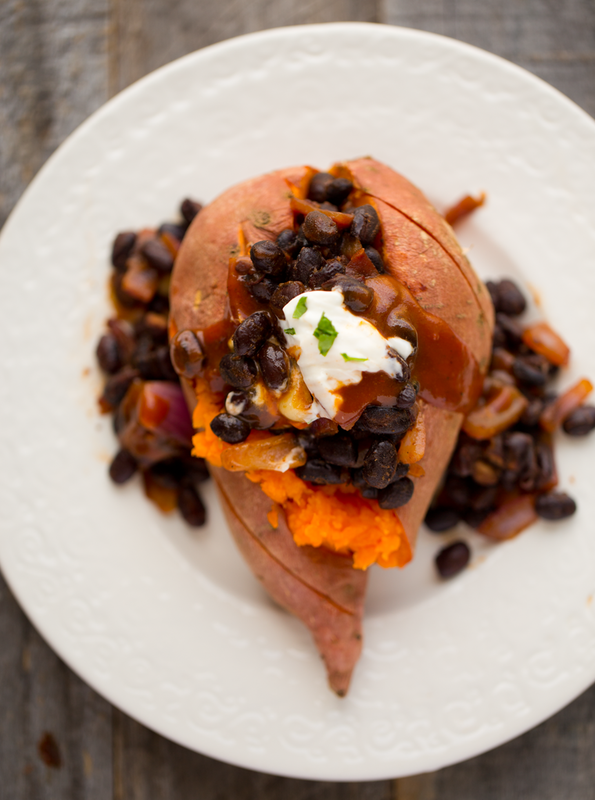 I used about 2-3 Tbsp then added a bit more to my sweet potato to serve. 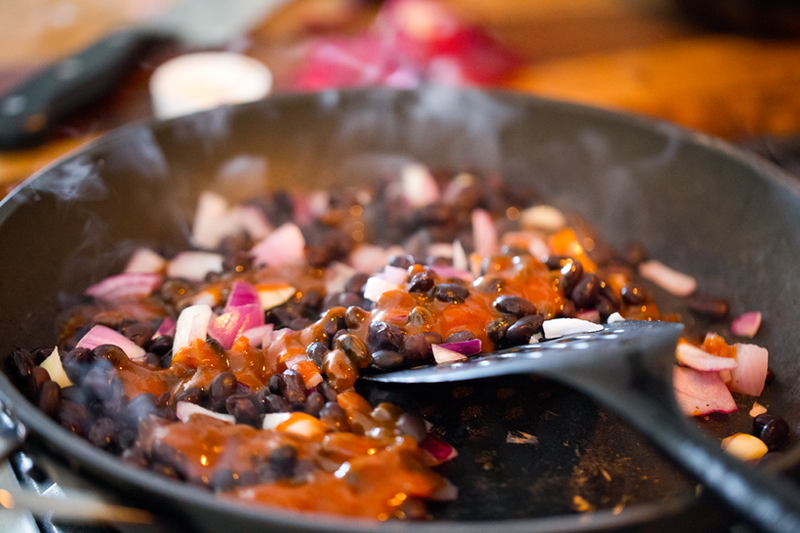 Toss BBQ sauce with bean mixture until warmed through and the sauce is absorbed - about 2 minutes. 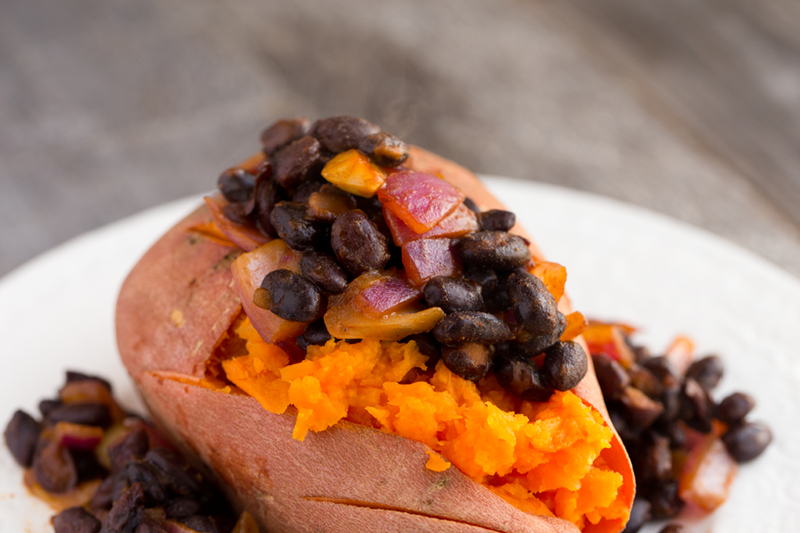 Slice open baked sweet potatoes and mash down the insides a bit, creating a crevice for the beans. Spoon the bean mixture on top of the potato -- add a good amount - at least a cup. Repeat for the second potato. Optional: Top the potatoes with a drizzle of warm BBQ sauce. Then dollop a teaspoon or more of vegan mayo on top. Then add the green garnish. Serve warm!